Leupold is a household name when it comes to the manufacture of various products from rifle scopes to binoculars and of course rangefinders. The company has been in operation for more than a century now and is based in Oregon, USA. Leupold golf rangefinders have been in the market for many years and they are most famous for being feature-rich. Since they started making rangefinders, Leupold has always targeted the high-end market, and this is the key reason why most of their products are well-built from the best materials and with the most advanced features. But, in recent years the company has also introduced several rangefinder models to cater for golfers looking for something more affordable. 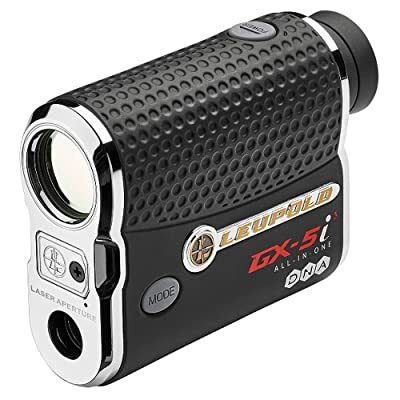 Some of the most outstanding Leupold golf rangefinders features include an advanced optical system, digital signal processing, pin hunter laser technology, one-touch scan mode, fog mode, and prism lock technology. Another thing that makes Leupold special is that its devices are more than regular GPS rangefinders. With Leupold, you will not get simple distances to the front, back and center, instead you get the exact measurements to the pin regardless of where it might be located. And to make things even better, Leupold rangefinders have a handy club selector feature. Tournament Legal – Although most Leupold golf rangefinders have a slope compensation feature, they are all tournament legal. The manufacturer allows the feature to be turned off, and for some models attaching a chrome faceplate is all it takes to make the rangefinder legal for tournaments. Feature-rich – You will hardly find any other brand of rangefinders with as many features as what Leupold devices have to offer. The features will vary from one model to the other and according to the price, but most of these rangefinders will have features like digitally enhanced accuracy (DNA), 6x magnification, prism lock, and pin hunter laser technology. Handy for club selection – The club selector feature that you will get on most Leupold rangefinder is one of the things that make them very popular. With this feature, the device will use the true range of your shots to provide appropriate club recommendations. This feature will not only improve your performance when on the course but also helps to speed up play. 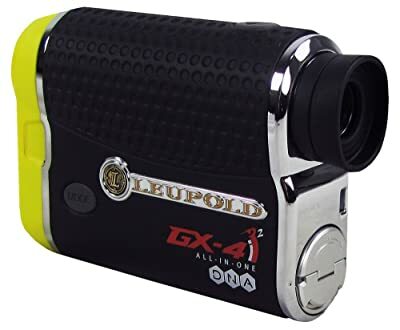 Sturdy and well-built – Generally their rangefinders are all well built with a sturdy housing and rubber armor designed to be rugged enough to handle the outdoor environment and accidental drops and bumps into things when on the course. Also, the rangefinders are designed with an excellent grip to keep them secure on your hand. Weatherproof – You can use your Leupold rangefinder in any weather condition as they are designed to be waterproof and resistant to other elements like dust and wind. The weatherproof construction also makes these rangefinders more durable. They are pricier – Historically Leuopold has been making golf rangefinder for the high-end market. Although they now have some more affordable models, typically their products are generally pricier when compared to what other brands have to offer. Not very beginner-friendly – Many beginner golfers will often find Leupold golf rangefinders hard to use at first. But, this is mostly because they have lots of features which typically take some time to get used to. Poor Battery – Leupold golf rangefinders will typically use CR2 lithium batteries which are not always very good. And this is more so when compared to what other top brands have to offer. 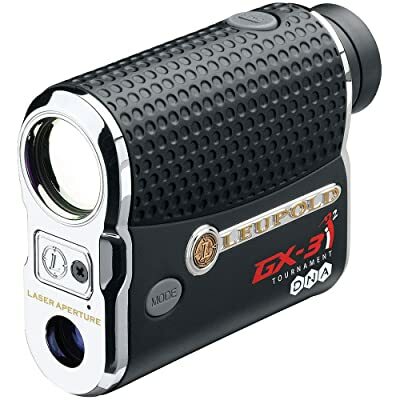 Leupold’s GX 5i3 is a top-notch and high-end golf rangefinder that is meant to ensure you have an easy time on the course. The feature-rich rangefinder makes use of some of the most advanced Leupold features and technologies. They include PinHunter 3 Laser and Prism Lock technology that make it easier and faster to lock on to the flag, One-Touch Scan Mode, Fog Mode, and Club Selector. Also, this high performing golf device has 6X Magnification and Fully Multi-coated Lens System. Prism Lock Tech: A handy feature that will be highly useful when playing on a course where the flagsticks have built-in prisms. With the prism lock technology, you can easily tell when you are locked onto the flag as the rangefinder will emit an audible tone when the rangefinder finds the flag. Fog Mode: Because you will not always play golf in a sunny day or under clear skies, Leupold gives this golf rangefinder a fog mode to ensure you can still use the device effectively under heavy mist and fog. One-Touch Scan: The one-touch scan mode will allow you to get multiple and quick readings when using this rangefinder. And all you need to do to use it is hold on to the power button. PinHunter 3 Laser Tech: Also designed to make the rangefinder faster and easier to use. The PinHunter 3 laser technology will filter out any background images and make it easy to zero in on your target. Club Selector: You do not have to guess the club to use with this rangefinder in your hand as it will use the distances from your previous shots and other things like hitting strength and slope to offer club recommendations. If you prefer a more rugged rangefinder that can withstand regular abuse for many years, the GX-4iA2 is what you need. Plus it is also designed to be completely weatherproof to make it great for use in any weather condition. Besides the rugged and weatherproof construction, the rangefinder is also as feature-rich as others by Leupold. Some of its key highlights include the Digital Enhanced Accuracy technology, PinHunter 2 with Prism Lock, Smart Key Technology, True Golf Range and the handy Club Selector function. Digitally Enhanced Accuracy: A revolutionary technology that you can get in most Leupold rangefinders, and it is designed to deliver faster and more accurate ranging. And thanks to the technology, you can get either true golf range or line of sight ranging in seconds. PinHunter 2 with Prism Lock: The improved PinHunter 2 technology works with the prism lock technology to make it easier and faster to lock on to the flag, and you will also easily tell you are getting the correct measurements to the flag thanks to the audible tone. Smart Key Technology: Designed to help make this a USGA rangefinder that you can use in tournaments. With the smart key, you only need to replace the smart key faceplate with a chrome faceplate to make your rangefinder tournament legal. True Golf Range: True Golf Range makes this a more useful and reliable rangefinder by ensuring you always get a ranging distance that is truer as it is matched to personal factors. Club Selector: This golf rangefinder will always recommend an appropriate golf club for each shot using information from your shot ranging measurements. Completely Weatherproof: A completely weatherproof housing helps to keep water, wind, and dust out of your rangefinder to make it useful in any weather condition and to make it more durable. Leupold’s GX-3i2 is another highly rugged Leupold rangefinder that has been built to last for years and will withstand the typical golf course abuse. The rangefinder also features a rubber armor coating that will provide an excellent grasp. And although it is relatively more affordable when compared to other Leupold rangefinders, it still has all the fantastic features. And they include the revolutionary DNA technology, a Vivid OLED Display, a Quick Set Menu for ease of use, PinHunter with Prism Lock, Weatherproof construction and other features like fog mode, one-touch scan, and fully multi-coated lens. Vivid OLED Display: The extremely bright display is designed to make it easier for golfers to read the measurements on the rangefinder. It does this by delivering more light to the eye of the user and with some easy to read letters and numbers. Quick Set Menu: With the one-handed controls on this RX rangefinder, it will be super easy to use when out in the course, and this is regardless of the weather and whether your hands are sweaty or not. Also, the Quick Set Menu is designed to ensure you can get the settings that you want with ease. Pin Hunter and Prism Lock: Pin Hunter technology is what gives Leupold rangefinders their speed and accuracy when on the course, and it will measure the distances clearly. Also, with the Prism Lock technology, you can easily tell when you lock onto the flag thanks to the instant and audible feedback. Solid Aluminum Construction: The incredibly compact and rugged aluminum body on this rangefinder is designed to make it highly durable as it can withstand almost anything. And the body also has a rubber coating that helps to provide an excellent grasp. This more affordable Leupold rangefinder is designed to cater to the golfers that might be shopping on a tight budget but are looking for something with some amazing features. And despite its relatively lower price tag, the RX-650 is also a sturdy and rugged rangefinder with rubber armor for an excellent grip. Its weatherproof construction helps to keep out elements like water and fog to make it great for use in any season, and it also features Fast Focus Eyepiece, High Contrast LCD display, Fully Multicoated Lens and the highly useful an convenient Scan Mode. Fast Focus Eyepiece: Adjustments when on the field should be super easy when using this rangefinder as it uses fast focus eyepiece that includes precision clicks to make the adjustment quick. Display: The high contrasts LCD display makes measurement readings an effortless task when using this rangefinder. The display is easy to read not only thanks to the high-contrast but also because the numbers and letters are bolder and larger. Fully Multicoated Lens: To ensure that you only get bright and pristine images, Leupold uses fully multicoated lens when making this rangefinder. Rubber Armor: The rubber armor on this rangefinder will provide some important shock protection in case you drop it accidentally and also ensures you always get a positive grip in any weather condition. 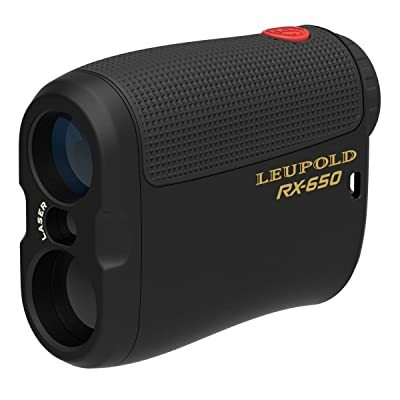 Weatherproof: Like most other Leupold golf rangefinders, the RX-650 comes ready for a lifetime of use in the course as it is designed to be completely water and fog proof which also helps to make it ideal for all weather use. If you are looking for a feature-rich rangefinder that is designed for use in any weather and has what it takes to withstand regular course abuse, you should definitely buy one of these high-performing Leupold rangefinders. Also, the fact that they have different models that come in different price ranges means that they have something for every golfer whether you are a beginner or experienced tour player. And you can use most of their rangefinders almost anywhere as they are USGA legal. If by any chance the Leupold rangefinder does not live up to your expectations, you have nothing to lose because the company is known for honoring their warranties.